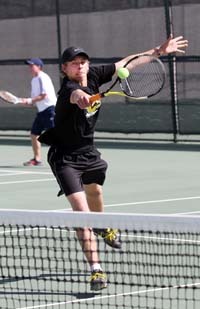 Taking the battle to visiting Twin Falls, the Wood River High School tennis team made strides in the close matches and kept dominating its chief Great Basin Conference rival with a 9-3 victory in Hailey. On its home courts Wood River swept girls' singles, boys' doubles and mixed doubles to improve over its 8-4 win at Twin Falls March 20. In the three matches that went to split sets, the Wolverines won two. The difference compared to last month's match in Twin Falls was Tuesday's outcome in No. 1 girls' doubles. Wolverine seniors Sloan Storey and Erin Murphy prevailed in a hard-fought match 6-1, 4-6, 6-4 over Kayla Ash and Natalie White of Twin Falls. Wood River (8-3 dual meets, 6-0 in league play) had a 151-94 advantage in games won Tuesday, compared to 133-108 in March's Bruins clash. The Wolverine boys won 4-2 in team totals, and the Hailey girls 5-1. The 2010 State 4A boys' doubles champs Raleigh Grossbaum and Charlie Grabow, seniors from Sage School, won 6-0, 6-0 in their No. 1 boy's doubles match. No. 2 boys' doubles Josh Morell and Cole Caminiti continued their straight-set hot streak in league play. No. 1 boys' singles Karl Wilander succeeded in straight sets. So did all girls' singles players, Haley Cutler, Lily Richards and Alex Feldman. Also winning were No. 1 mixed Stephen Pfeiffer-Hannah Baybutt in split sets, and No. 2 Quentin Dowdle-Margaret Reutter. In a scheduling change of location, next week's triangular meet featuring Wood River, the Community School and Burley has been shifted from Hailey to Sun Valley. The matches on Tuesday, April 24 will now be played at Sun Valley Tennis Club. Here is the schedule of matches, with junior varsity matches due to follow the varsity matches for each school: Tuesday at 2 p.m., Wood River vs. Burley; at 4 p.m., Community School vs. Burley; and at 6 p.m., Wood River vs. Community School. Boys' singles: 1—Karl Wilander (WR) 6-3, 6-2 over Dallas Hunt (TF). 2—Mike Zitterkopf (TF) 6-4, 6-0 over Chase Hutchinson (WR). 3—Zach Davis (TF) 8-6, 7-6 over Michael Niedrich (WR). Girls' singles: 1—Haley Cutler (WR) 7-5, 6-2 over Brittani Pierce (TF). 2—Lily Richards (WR) 6-3, 6-2 over Hailey Orton (TF). 3—Alex Feldman (WR) 6-1, 6-4 over Amy Tikasky (TF). Boys' doubles: 1—Raleigh Grossbaum-Charlie Grabow (WR) 6-0, 6-0 over Andy Carter-Ryan Algate (TF). 2—Josh Morell-Cole Caminiti (WR) 6-0, 6-2 over Brad Pierce-Shane Tucker (TF). Girls' doubles: 1—Sloan Storey-Erin Murphy (WR) 6-1, 4-6, 6-4 over Kayla Ash-Natalie White (TF). 2—Carly Athay-Rachel Webster (TF) 6-4, 2-6, 6-4 over Tate Morell-Alex Taylor (WR). Mixed doubles: 1—Stephen Pfeiffer-Hannah Baybutt (WR) 7-6, 3-6, 10-3 over Rudy Bowman-Karin Olsoln (TF). 2—Quentin Dowdle-Margaret Reutter (WR) 6-1, 6-2 over Jacob Wickern-Brook Woods (TF).